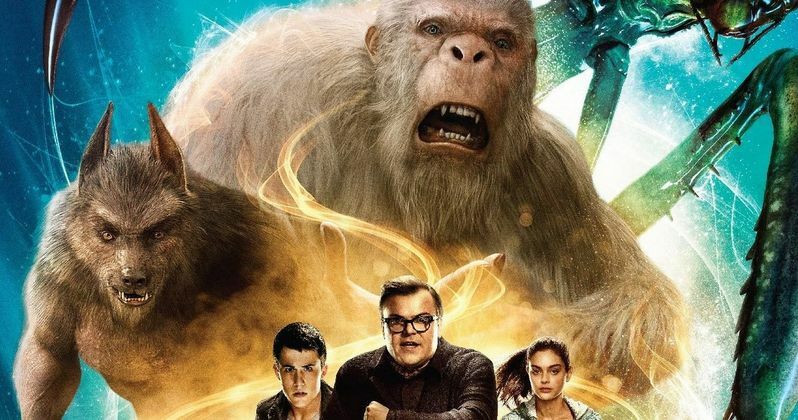 Last month, Sony Pictures released both a domestic and international trailer for Goosebumps, an adaptation of R.L. Stine's popular book series. Today, Sony Pictures Brazil has released the second international trailer that includes plenty of new footage featuring Jack Black as R.L. Stine himself. We also get a look at a thrilling sequence involving a massive ferris wheel rolling down a hill. Upset about moving from a big city to a small town, teenager Zach Cooper (Dylan Minnette) finds a silver lining when he meets the beautiful girl, Hannah (Odeya Rush), living right next door. But every silver lining has a cloud, and Zach's comes when he learns that Hannah has a mysterious dad who is revealed to be R.L. Stine (Jack Black), the author of the bestselling Goosebumps series. It turns out that there is a reason why Stine is so strange... he is a prisoner of his own imagination - the monsters that his books made famous are real, and Stine protects his readers by keeping them locked up in their books. When Zach unintentionally unleashes the monsters from their manuscripts and they begin to terrorize the town, it's suddenly up to Stine, Zach, and Hannah to get all of them back in the books where they belong. The supporting cast is rounded out by Amy Ryan, Ken Marino, Jillian Bell, Steven Krueger, E. Roger Mitchell, Jeremy Ambler and Clare Halstead. The adaptation is set to hit theaters October 16, going up against Disney's Bridge of Spies and Universal's Crimson Peak. Rob Letterman (Monsters Vs. Aliens) directs from a script by Scott Alexander and Larry Karaszewski (Big Eyes), Darren Lemke (Turbo) and Carl Ellsworth (Red Eye). This will be the third time Jack Black and Rob Letterman have worked together, with the actor voicing Lenny in Shark Tale, and starring in 2010's Gulliver's Travels. Given the number of Goosebumps stories that could be told, this adaptation could spawn a sequel, but it's too soon to tell. Check out the latest footage from this new adaptation, and let us know what you think. Can this fantasy adventure pull in big bucks at the box office when it hits theaters this October? Or do you think the competition is too stiff for this family-friendly movie? It surely will make Halloween a whole lot more fun this years! And it might even give you some costume ideas.